The most important thing you need to know about dogs and pancreatitis is, they could die if left untreated. My dog Bailey died, not because he wasn’t treated but because he was in the “care” of incompetents who decided feeding him a can of dog food after being at their clinic just one day was a good idea. Actually that sounds like “untreated” to me. 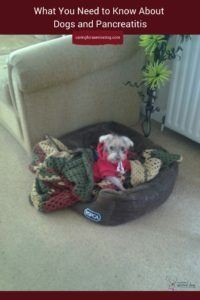 I had no previous experience caring for a dog with pancreatitis, so blindly trusted they would help him. I would hate for you to have to experience this kind of loss because of something that is almost always treatable. Knowledge is power, to quote a cliché, and this article will give you all you need to ensure your dog has a better outcome than mine. What function does the pancreas serve? usually lie dormant until they reach the small intestine where they start doing their job. However if they are activated prematurely, before they reach their destination, they cause the pancreas to digest itself. Simply put pancreatitis is an inflammation of the pancreas, and it is painful. Not only that but it can progress quite rapidly, to the point where it is no longer possible to treat. There are two types – acute and chronic. Acute means it comes on suddenly and lasts for a short period of time. It can be nothing more than mild discomfort or full blown life threatening. It typically happens around the holidays (but not exclusively) when we’re eating tons of high fat food and the dog gets his fair share of table scraps. It can also happen when he’s out walking and picks up something he shouldn’t. Chronic means ongoing and is often a result of having a bout of acute pancreatitis. This too can range from mild discomfort to deadly serious. The most common signs are loss of appetite, vomiting, and abdominal pain. Signs for both acute and chronic pancreatitis are similar so don’t try and guess which one your dog has. A good rule of thumb to follow and one I talk about a lot is – If you notice any changes in your dog’s behaviour, even if it seems slight, call your vet. If they brush you off but you know there’s something wrong insist on an appointment. You know your dog best and treating something early can mean the difference between life and death, and that is certainly the case with pancreatitis. I tell this story years later with a lot more experience under my belt, and without the naïve belief that vets have all the answers. The first experience I ever had with pancreatitis was with my dog Bailey. He was old, no idea how old, and a foster we never gave back. Foster failure anyone!! Sadly this condition struck after we had moved to a new city, and hadn’t yet found the amazing vet I have now. I know this would have had a happy ending if we had. sent him home. He started throwing up not long after, and when I called to tell them, they assured me he was fine when he left. There are vets who believe a dog needs 3 days on fluids, they believed 1 was enough. After a torturous night of him being in pain (yes he had medication) and me watching the seconds tick by, I took him to see the vet in our old city, and he immediately admitted him for 3 days of fluids. Unfortunately by that time his pancreatitis was too severe to save him. I lodged a formal complaint with the veterinary governing body, even though they told me it’s unlikely I would win. They all stick together don’t they, even at the cost of a life. I didn’t win and was forced to pay the vet bill. Imagine how that felt! That experience made me even more determined to demand the best care for my animals, and to learn as much as possible about every condition so I stay on top of all treatment. I’ve always taken vet care seriously, and done the best I could to find great professionals, but sometimes it takes a serious illness to show how skilful, or not, someone truly is. Red has had a few bouts of pancreatitis, the first attack coming after eating coconut oil. I started adding it to her diet because I had read it could possibly help with dementia, which see suffers from. Of course I consulted my vet first and even gave her half the recommended dose. I’ve learned when the diarrhea starts it’s time to leap into action, no hanging around to see if it clears up on its own. It can be so dangerous in old dogs I won’t take a chance. 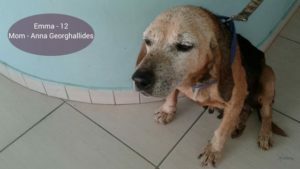 This past November she was slammed with a very bad case, and despite fluids and medications she showed no sign of improving after 2 ½ weeks. All she did was sleep, and a few times a day I would wake her so she could eat (which she barely managed), pee and poop. That is not the life I wanted for her so I made the decision to let her go. Wouldn’t you know the next morning when we were about to leave to the vet’s office she perked up! What caused that horrendous episode? I was shocked when I realised the same food she’d been eating for a long time, was the very thing that caused it! Red has been eating k/d for at least a couple of years, but for a period of several months I switched her to a home cooked diet created by my holistic vet. I eventually went back to her prescription food (it’s a long story!! ), incorporating her home made food into it. When my k/d order was cancelled the morning it was to be delivered, and a new batch not being available for 3 days, she had to rely exclusively on her homemade food again. After a couple of k/d meals she got diarrhea and things went from bad to worse. I assumed it was a bad batch because she had never been affected by it before, so I sent it back and ordered it elsewhere. It turns out that although her kidney diet doesn’t contain much fat, being off it for just 3 days was enough to cause an attack. I know to slowly introduce a new food to a dog, but this wasn’t new! So what was she going to eat? I am dealing with a dog with several conditions, two of which are kidney insufficiency and pancreatitis. My vet told me the diet for one is not good for the other so I decided it was more important to feed her for pancreatitis. I was given a can of Hills Prescription Digestive Care i/d (low fat) to try after another recent bout about a month ago, and to my delight she loved it. I am sticking with it and I add boiled chicken breast, quinoa, whole grain rice, peas, squash, carrot and some broccoli for interest and added benefits. When she has an attack there’s always at least 1 day at the vet’s on fluids, sometimes 2 but she never stays overnight. Just because your dog is on a low fat diet, doesn’t mean he can’t develop pancreatitis. Simply eating a large amount of fatty food at one time can cause acute pancreatitis, which is why it’s so important to watch what your dog eats and discourage family and friends from sneaking him table scraps. Your vet can get a pretty good indication of whether or not there is a possibility of pancreatitis based on what you tell him about your dog’s condition and symptoms. 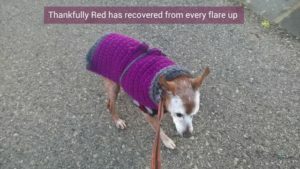 Because Red has chronic pancreatitis, she is treated right away because we know what it is. A blood test is done, if I want, to confirm whether the pancreas is affected although that particular test cannot tell you to what extent. vets prefer to start simple and depending on what, if anything those initial tests reveal, more complex tests would be needed. Your vet will typically start with blood and urine tests as many can be done in house with relatively quick results. Depending on what he finds, or doesn’t find in some cases, x rays and/or an ultrasound may be needed. It is possible your vet may wish to repeat some of the tests at a later date to monitor your dog’s recovery. Whether the cause is known or not, your vet’s primary focus will be on keeping your dog comfortable, free of pain and hydrated. I discussed my vet’s treatment protocol for Red, but things may differ in your dog’s case. Treatment is based on dealing with dehydration and restoring electrolyte balances through IV and fluid therapy, controlling other symptoms such as nausea, diarrhea and pain with medications, and providing nutritional support. If pancreatitis is due to a side effect of medication, your vet will discontinue the medication immediately. You will be given medications to administer at home over the course of a week or two depending on what’s needed. You may be given antibiotics, anti-nausea medications and a nutritional support paste until your dog is back to eating normally. Some rehydration support may also be recommended for a few days. If you follow a more natural or holistic diet and the recommended one is not, voice your concerns, learn what ingredients should be avoided and why. Bring the packaging of the food you prefer, to see if it’s suitable. Will your dog need to be hospitalised? It depends on how severe the pancreatitis is and your dog’s overall health. A few hours of fluids at the practice may be enough, while some dogs may need 3 days. If the practice does not have overnight staff, or you know your dog will not do well being left alone, it is possible you may be allowed to bring him home overnight and go back in the morning. Your vet will discuss your options with you. cases haven’t been caught quickly have a chance for a good outcome, but a lot will depend on the experience of the vet and the treatment plan prescribed. It’s great to know the condition can be managed, and your dog can lead a normal life. However it does require vigilance and cooperation from other household members. Pancreatitis is not a “one off” condition. It is very possible your dog can be affected again, which is why it’s so important to follow the prevention guidelines and the advice of your vet. You want to do what you can to decrease the likelihood of another attack, but if it does happen you’ll be better prepared. Since many cases happen over the holidays when rich fatty food is in abundance, be extra vigilant about what your dog is putting in his mouth, and keep an eye on anyone slipping him food. 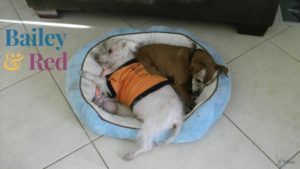 What is the best diet for a dog with pancreatitis? As I mentioned earlier I had a real struggle trying to find the right diet for my dog, particularly because her kidney issues are such a factor. Red is now eating Hills Prescription i/d (low fat version) along with boiled chicken breast and a mixture of whole grain rice, quinoa, peas, broccoli, carrots and squash. I read coconut oil is recommended because it is a medium-chain triglyceride (MCT), a fat that does not need pancreatic enzymes for digestion. Remember Red’s first pancreatitis episode was from tiny amounts of coconut oil!! Whatever direction you decide to go in please remember – LOW FAT and consult with your vet or holistic vet. Sometimes your dog being sick is just your dog being sick, and other times it is much more serious. If your dog is vomiting, has diarrhea or lost his appetite, call your vet’s office immediately. Let them know of your concerns, and be sure to mention anything your dog may have eaten. Pancreatitis can attack fast, and attack hard, so the sooner you start treatment the better your chances of a positive outcome. If you have a dog with pancreatitis, or have experience with this condition, we would be happy to hear your experiences. Mr. N had a case of acute pancreatitis several years ago. It was super scary. He was so lethargic. I wasn’t happy with our then vet’s treatment of him either. I still watch his fat levels but he’s back to his normal diet and is doing pretty well. Poor Mr N, he’s so lucky he’s back to normal, despite the vet. Oh my gosh, I am so sorry to read about Bailey. I know it was years ago, but what a sad story. We have not had an episode of pancreatitis with Ruby. But after reading the symptoms, I am wondering if my former dog did. He was notorious for getting in the trash or grabbing stuff on the street. 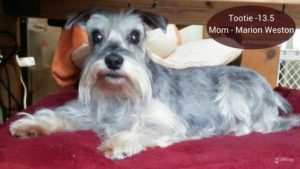 He had several bad bouts of digestive problems and was hospitalized several times. They never labeled it pancreatitis but now I wonder. Thank you, it is a very sad story. It is possible it was pancreatitis, but it’s interesting why a vet never “labelled” it. As long as he recovered that’s what counts. Thanks Kamira. I know what you mean, I thought it was pretty much just a diet thing, but turns out there are other factors. Having said that, diet seems to be the number one contributing factor so it’s very important to keep an eye on those high fat foods, and the people who give in to begging at the table!! So sorry about your baby. Yes, unfortunately, pancreatitis can be deadly. Now, the strategy of getting them to eat as soon as possible seems to be a legitimate latest approach backed by science. What is being fed, though, is just as important as it turns out. I know vets have different approaches about how soon to start feeding but you’re right, it’s what was fed that was most likely the problem, although I still believe they should have kept him on a drip longer. 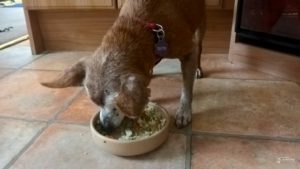 Small pieces of boiled chicken breast and some rice is one thing, a can of dog food an entirely different story. I agree about the captchas, some are impossible to read!! Different approaches for sure, and they did try and convince me new protocols say 24 hours, but I don’t believe that is the right thing for every dog. Given the severity of my dog’s condition, it obviously was not the right course of action. Certainly not when it involved feeding him a can of dog food. What happened to boiled chicken? Poor Bailey! I can’t imagine how hard it must have been to watch him suffer. Your post has given me a lot to file away in the memory banks and think about. Pancreatitis as a side effect to Prednisone was particularly alarming for me since Bernie takes a low dose of Prednisone, usually every other day. I’m adding questions to my list to ask our vet on our next visit. Best wishes with ongoing positive results with treating Red. It was horrendous waiting for morning to arrive so I could finally see someone I trusted. I’m so sorry that Bailey didn’t receive proper medical care. One of my sisters has a dog who had a severe bout with pancreatitis about two years ago. Fortunately, he recovered and has not had any more issues. Thanks Beth, I can’t help but partially blame myself for not understanding how serious the situation was. I’m glad to hear your sister’s dog recovered and is doing well. I have a friend who has a senior Poodle who is beginning to have problems with his pancreas. She is feeding him the Royal Canin and he does pretty well on it, but she has to feed him several small meals a day. I’m beginning that search for the right food for Truffle’s bladder stones. It must be something that will help prevent future stones and something she will eat! I think part of our problem right now is that she is recovering from surgery and her appetite isn’t normal, plus she’s in the onesie, which she hates. I hope after it’s taken off this week and she’s been a week after the surgery, that she’ll be willing to eat her food. Hope Truffle is feeling better by now. That’s the problem isn’t it – something that will prevent issues and she’ll like!! Good luck with that, many of my cats have been so finicky. Are there ingredients that contribute to stones, and do you know what she should avoid? 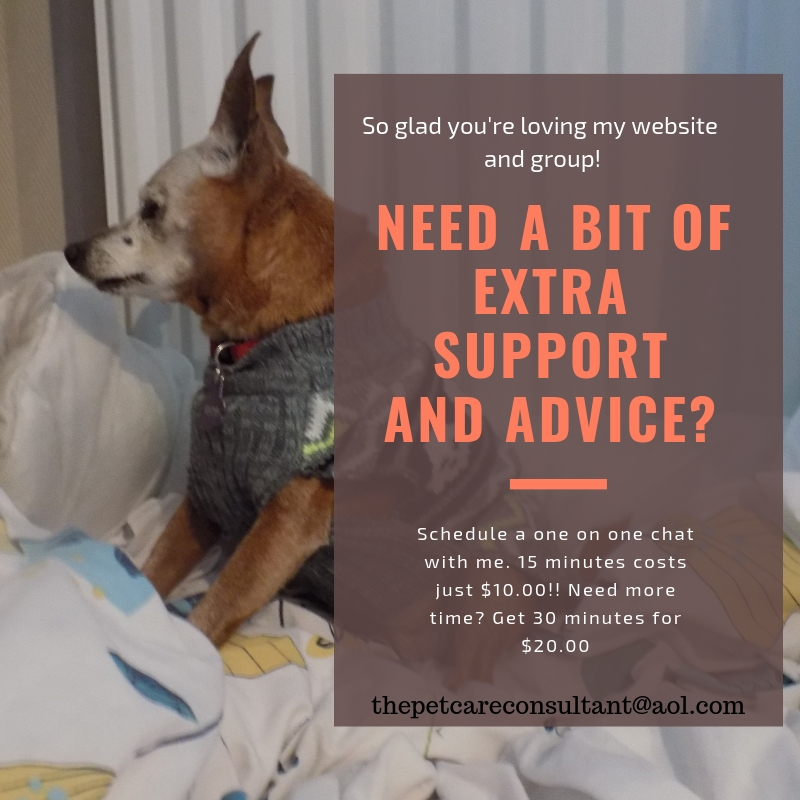 Our pets certainly teach us to be advocates for their health care…so often it takes heartbreak as happened to you that makes us wake up and stand firm and ask many questions to get to the answers we feel we have found either through Dr. Google or intensive research from holistic vets. I have never had a dog with pancreatitis even though one dog had Cushing’s disease and another was hypothyroid. Thank you for giving us a review of the process you have gone through to keep your baby with you. It’s funny you say that about heartbreak teaching us to be advocates. I always have been very serious about the care my pets receive, but I’ve never found myself in situations with these type of vets before. My experiences over the past few years have made me fierce about demanding the care they deserve, and not tolerating apathy or negative attitudes towards seniors. How frustrating that Bailey got poor care – it was good you registered a complaint as they may be more careful going forward. Thanks for sharing all this information. Hoping I don’t need it but Kilo is a scoundrel and often steals or begs for fatty food so better to be prepared. I am surprised about coconut oil as i have always read positive things about small amounts. Best wishes for Red. I’m afraid my complaint won’t make one bit of difference to those people, but I had to do it. What a rascal!! I’ve read a lot of positive things about coconut oil as well, I just think Red’s system has become so much more sensitive than it used to be because of the medication she’s been taking for so long. My brother’s dog got pancreatitis once. He had been feeding him too much table food. He felt so bad when he learned that was the cause of it! Poor Ziggy has a very sensitive stomach too. Poor guy I’m sure he felt bad, but at least it was caught before it became too serious to treat. Thanks for this super informative post. 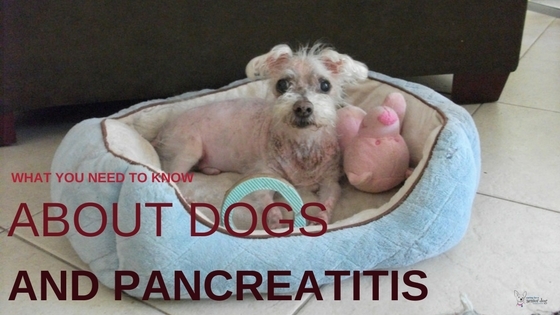 I know how scary it can be when our dogs are in pain, and this post will hopefully inform pet owners on the symptoms and proper courses of action should Pancreatitis be the diagnosed issue. I’m so sorry to hear about the passing of your dog, Bailey, due to a veterinarian office’s incorrect care. I hope this post arms readers with enough information to know what to ask for and demand of their veterinarians. Glad you liked it Bryn. I do hope it helps others take these symptoms seriously, and more importantly make sure their vets take them seriously. This vet may have tried to convince me it was okay to feed Bailey a can of dog food after 24 hours since new research supposedly recommends waiting only 24 instead of 72 hours, but given how severe his condition was, they made a mistake. Always ask questions and do your research!